The story of Chris McCandless, who gave away his savings, hitchhiked to Alaska, walked into the wilderness alone, and starved to death in 1992, fascinated not just New York Times bestselling author Jon Krakauer, but the rest of the nation too. Krakauer's book and a Sean Penn film skyrocketed Chris McCandless to worldwide fame, but the real story of his life and his journey has not yet been told - until now. Carine McCandless, Chris's sister, featured in both the book and film, was the person with whom he had the closest bond, and who witnessed firsthand the dysfunctional and violent family dynamic that made Chris willing to embrace the harsh wilderness of Alaska. 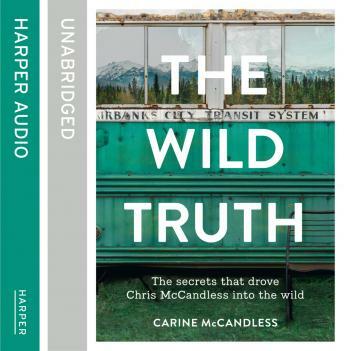 Growing up in the same troubled and volatile household that sent Chris on his fatal journey into the wild, Carine finally reveals the broader and deeper reality about life in the McCandless family. For decades, Carine and Chris's parents, a successful aerospace engineer and his beautiful wife, raised their children in the tony suburbs of Northern Virginia. But behind closed doors, her father beat and choked her mother. He whipped Carine and Chris with his belt. He cursed them, belittled their accomplishments, and told them they were nothing without him. Carine and Chris hid under the stairs, hoping to avoid his wrath. They were teenagers before they learned they were conceived while their father was still married and having babies with his first wife, who finally summoned the courage to leave him after he broke her back in a fight.